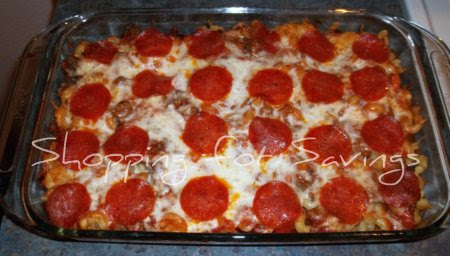 Pizza Casserole Bake Recipe – Perfect For These Colder Temps! With the temperature dropping, are you looking for casserole recipes? It’s been cold and rainy here so we were looking for something along the lines of comfort food. Casserole recipes usually fit the comfort food-bill nicely! This pizza casserole bake is comfort food with a twist – not quite mac & cheese, not quite pizza. It’s fairly quick and easy to throw together, though, and is also easy to customize to your own personal tastes. Season ground beef with garlic powder, salt and pepper and brown in a skillet until no longer pink. While beef is browning, cook pasta according to package directions (about 10 minutes). Spread a thin layer of sauce in the bottom of a 9×13 pan. Cover the sauce with 1/2 of the cooked pasta. Cover the pasta with 1/2 of the ground beef mixture. Pour 1/2 of the sauce over the pasta. Top with the remaining pasta. Cover the pasta with 1/2 of the cheese. Top with the remaining beef. Pour the remaining sauce over the top and then cover with them remaining cheese. Place rows of pepperonis on top of the cheese to finish. Cover with foil (spray the foil first to keep it from sticking to the cheese) and bake for 30 minutes. Remove the foil and bake an additional 15 minutes. Normally when I make this to take to a potluck or gathering, I add a can of mushrooms with each layer of ground beef. The kiddos aren’t mushroom fans, though, so I leave them out for them. You could easily add any other pizza ingredients you’d like – sausage, green pepper, onion and bacon would all work nicely. That looks yummy! I'm definitely going to have to add that to my menu plan this month. Thanks for linking up this to my Create and Inspire Party… Hope you can link up next week too!